These days, the Western Gateway is filled with offices, restaurants and things to do. But as few as 10 years ago, that wasn’t the case. Here’s a look back at how the area developed over time. 1998 Meredith Corp. completes new office headquarters. An effort led by retired chairman Jack Rehm. March 1999 Gateway Redevelopment Plan begins to take shape. 1999 Demolition of older buildings in the Western Gateway begins. 2000 $137 million Allied/Nationwide Insurance building completed. March 2001 City Council approves Bookeys’ plan to redevelop The Temple for Performing Arts. September 2002 $9 million redevelopment of The Temple for Performing Arts completed. September 2004 $8 million John and Mary Pappajohn Education Center completed. December 2005 Nationwide Mutual Insurance Co. announces it will build two additional office buildings. April 2006 $25 million downtown Des Moines Public Library completed. June 2006 Des Moines Arts Festival moves its location from the downtown bridges to Western Gateway Park. 2009 $30 million John and Mary Pappajohn Sculpture Park completed. May 2011 Americana Restaurant & Lounge opens across from the sculpture park. 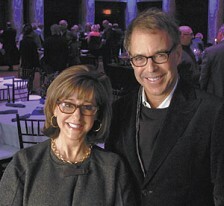 Against the odds, The Temple for Performing Arts has become a lively downtown Des Moines gathering place. The smell of coffee and the sound of chatter emanates from the Starbucks coffeehouse. Visitors and downtown workers grab New York-style pizza from Centro. And the Civic Center of Greater Des Moines is able to pack the theater on the second floor, while the ballroom on the fourth floor is booked through 2013. Both student musicians and adult musicians use the building to practice their craft, and there’s hardly any open office space. The synergy of the place now is obvious and powerful. So much so, that it’s easy to forget that 10 years ago, the Temple was an eyesore that the city wanted to tear down. Business leaders and city officials were working together to create a grand Western Gateway with new buildings surrounding green space. Conventional wisdom was that old buildings such as the Temple would hinder growth rather than spur it. “When we were doing work on it, we’d see people driving by really slowly, looking at it and shaking their heads, thinking, ‘Man, am I glad I’m not one of them,’” said Pamela Bass-Bookey. As the city begins to redevelop Walnut Street from a bus transit mall into a retail and entertainment district, leaders can learn from the Bookeys’ success. And much like the Temple, people are wondering what can come from Walnut Street and how the DCA will attract business to the area, Lyons said. “It takes a special city to have leaders who can look ahead,” he said. Originally built in 1913, the Masonic Temple was “noted for the opulence of its Grand Lodge with intricate moldings, faux marble columns and elaborate stained glass windows,” according to the Temple’s website. By the late 1980s, however, little of that grandeur was obvious. With a pawn shop and a wig shop on the first floor and bail bond offices on the third floor, the Temple was on the city’s radar to be demolished under a plan to develop the Western Gateway. In 1997, it was added to the National Register of Historic Places, but even that designation couldn’t save it. “There was a lot of back and forth about tearing it down -- it was assumed it would be torn down,” said Paul Rottenberg, president of Orchestrate Hospitality, which managed the Temple from 2002 to 2011. Enter developer Harry Bookey and his wife, Pamela Bass-Bookey. The two 4,000-square-foot ballrooms in the center of the building made it difficult to lease space, Bookey said, adding that “between the cost of construction and the lack of rentable square footage, it was a challenge to get it financed.” Nonetheless, he put together a plan to save the Temple, battled the City Council and eventually won. Even after the Bookeys secured the site, they continued to face challenges when it came to putting the various pieces of the project together. A friend eventually introduced them to a sandwich shop owner -- George Formaro -- and shortly after that, Centro was born. So they set their sights high and decided the Temple should house the first Starbucks in the state. Starbucks had other ideas. The company was interested in opening a store in the suburbs because Midwest downtown stores were not performing well, Bookey said. But the couple continued their pursuit, showing off the building to a Starbucks broker. The corporate offices remained undecided for 11 months. “We didn’t know until a month before the Temple opened,” Bookey said, adding that the decision was so contested that then Gov. Tom Vilsack called and spoke with Jim Donald, who at that time was CEO of the coffee company, to help seal the deal. Joseph Giunta, music director of the the Des Moines Symphony, had dreamed of adding an educational component to the orchestra to give Des Moines students a place to learn. Bookey asked him to come and take a look at the building as a possible location for the proposed academy. But Giunta and the Symphony signed on to the project shortly after. Here’s why: “When I finally got to the fourth floor and saw the stained-glass windows and the ballroom, that’s when I knew this was a place that had great potential,” he said. They were later joined by the Iowa Youth Chorus and the Civic Center of Greater Des Moines. Since that time the Civic Center’s and Symphony’s relationships with the Temple have thrived. “We wanted 100 students the first year, and had 300,” Giunta said. It’s grown from there, with about 450 students currently enrolled. The organization also boasts three youth symphonies, summer camps and other programming. Thanks to renovations, the Symphony now can practice at the Temple as well. The Bookeys and the organization put new lighting in the fourth-floor ballroom and fixed the acoustics by adding carpet and closing off the room with drapery. The Civic Center had such a huge initial success with the play “Triple Espresso,” the organization has created a Temple Theater series, which consists of three shows. Like everything else, the Civic Center’s involvement and initial success was more of a serendipitous moment than a calculated move. Bookey said he originally planned to put a jazz club on the second floor; however, plans were not working out. He then spoke with Jeff Chelesvig, the Civic Center’s president and CEO, who knew an actor who had performed “Triple Espresso” in a renovated Masonic temple in Oregon. “He asked if we’d be willing to build a black-box theater, and at that point, we were like, ‘why not,’” Bookey said. “Triple Espresso” was originally scheduled for six weeks and ended up running 18 months, making it the longest-running show in Iowa. Now the Temple is a cultural hub, giving students and adults a place to gather and make music. It sits next to the Des Moines Public Library and near the John and Mary Pappajohn Sculpture Park. It’s one of the city’s most popular places to hold weddings and events, with people already booking dates in 2015. “Knowing in these early days what they had to go through with the City Council, with the neighbors, with the conflicting library people – they really stepped up to the plate in terms of making this happen,” Giunta said. Surrounded today by trendy restaurants, a sculpture park and some of the city’s biggest employers, the Temple neighborhood is a far cry from what it used to be when the only people in the area at night were teenagers scooping the loop. “It can’t be stressed enough that no one stayed (downtown) after 5. No one,” said Chris Diebel, who worked for the Bookeys as an intern at the time of the renovation. Rottenberg admitted that he had his doubts that the Temple would be successful, but that between Iowa’s first Starbucks, Centro’s immediate popularity and the Civic Center’s home run with “Triple Espresso,” the Temple’s tenants turned an uninhabited corner of the community into a place that thousands of people use each day. Restaurateurs eventually took notice, and now the area boasts some of the city’s most popular eateries, including Django, Americana Restaurant & Lounge, Proof and Host. The library was completed in 2006 and the Des Moines Art Center put in the sculpture park in 2009. Some of the city’s largest festivals, such as the 80/35 music festival and the Des Moines Arts Festival, are held there each summer, things the Bookeys never expected to happen but hoped their vision could spur. “We’re a little biased, but we think it was the seminal event that brought development down here,” Bookey said.